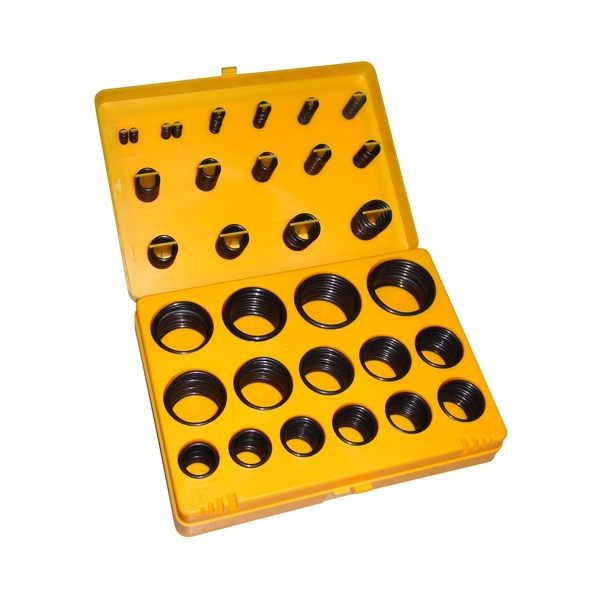 A selection of 404 high quality Nitrile (NBR 70) O-Rings in 30 different metric sizes. Temperature range: -30°C to 120°C. Kit comprises: REGQ751 - 3mm x 2.0mm (18) REGQ752 - 4mm x 2.0mm (18) REGQ753 - 5mm x 2.0mm (18) REGQ754 - 6mm x 2.0mm (18) REGQ755 - 7mm x 2.0mm (17) REGQ756 - 8mm x 2.0mm (17) REGQ757 - 10mm x 2.0mm (17) REGQ758 - 10mm x 2.5mm (14) REGQ759 - 11mm x 2.5mm (14) REGQ760 - 12mm x 2.5mm (14) REGQ761 - 14mm x 2.5mm (14) REGQ762 - 16mm x 2.5mm (14) REGQ763 - 17mm x 2.5mm (14) REGQ764 - 19mm x 2.5mm (14) REGQ765 - 19mm x 3.0mm (12) REGQ766 - 20mm x 3.0mm (12) REGQ767 - 22mm x 3.0mm (12) REGQ768 - 24mm x 3.0mm (12) REGQ769 - 25mm x 3.0mm (12) REGQ770 - 27mm x 3.0mm (12) REGQ771 - 28mm x 3.0mm (12) REGQ772 - 30mm x 3.0mm (12) REGQ773 - 32mm x 3.0mm (12) REGQ774 - 33mm x 3.0mm (12) REGQ775 - 35mm x 3.0mm (12) REGQ776 - 36mm x 3.0mm (12) REGQ777 - 38mm x 3.0mm (12) REGQ778 - 38mm x 4.0mm (9) REGQ779 - 42mm x 4.0mm (9) REGQ780 - 45mm x 4.0mm (9) O-Ring size refers to inside diameter x cross section (mm).